Alagoas is one of 27 federal units of Brazil and is located in the east of the Northeast. 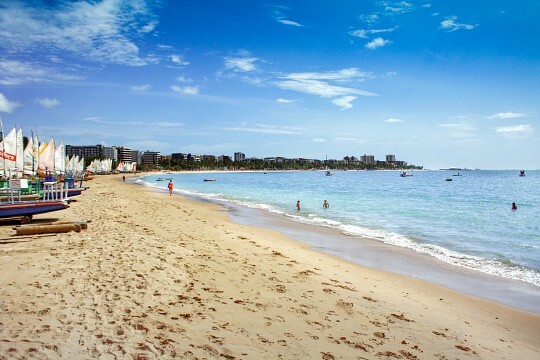 It borders Pernambuco, Sergipe, Bahia, and the Atlantic Ocean and its capital is the city of Maceio. The city of Alagoas is one of the largest producers of cane sugar and coconut of the country and its economy is based on farming. Alagoas is the land of the mussels, the seafood of the ponds which serves as food to the coastal population, and the coconut water. The city also has one of the richest folklore of the country. One of the strengths that attract tourists from all over the world is the wealth of typical dishes which are simply awesome, and the white sand in combination with the warm waters of the beaches. Considered the most fashionable resort town of Alagoas, the Barra de São Miguel has a lush natural beauty, diverse with white sandy beaches, clear waters, and islands of mangroves. For its proximity to Maceio the Barra de São Miguel offers tourists a complete infrastructure with many hotels and inns. 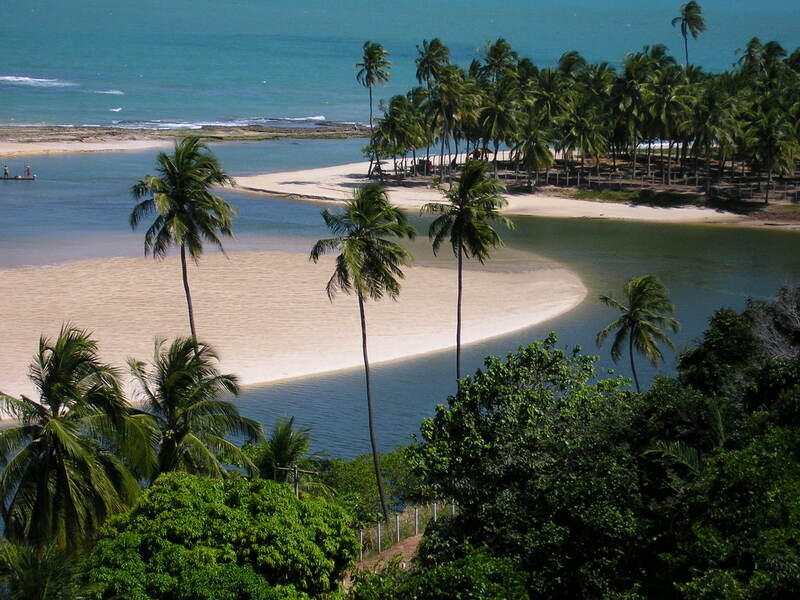 The tourists who visit the Barra de São Miguel should also go to the Beach of Gunga - located on a winding curve between the Atlantic Ocean and the Roadmap Pond - and also the Beach of Barra - an aphrodisiac beach with calm waters and blue-green color. Maceio has a great potential to attract tourists due to its natural beauty and cultural diversity in addition to offering several leisure options and modern spaces for business, such as the new Cultural and Exhibition Center of Maceio - in Jaraguá neighborhood. Maceio also has beautiful beaches, with their waters ranging from blue and green, and natural pools at 1.2 miles from the coast. The main beaches of the capital of Alagoas – Maceio – are the Pajuçara Beach, the Beach of Ponta Verde, the Jatiúca Beach, and the Beach of the Cruz das Almas. Maragogi is now a major tourist hub, serving as a gateway to the states of Alagoas and Pernambuco, and becoming the second-largest tourist center of the state. Its beaches have calm waters, white sands, and dense coconut groves. Among the main beaches of Maragogi stand the Beach of Barra Grande, the Peroba Beach, and the Burgalhau Beach. Marechal Deodoro is a privileged point of Alagoas. In a beautiful part of the Atlantic Ocean, the city also includes in its boundaries the most beautiful and most important state ponds: the Manguaba and the Mundaú. These ponds are excellent representatives of the economy and the tourism of Alagoas – they form a lagoon complex of great ecological importance, due to the mangroves and the diverse wildlife that exists in them. 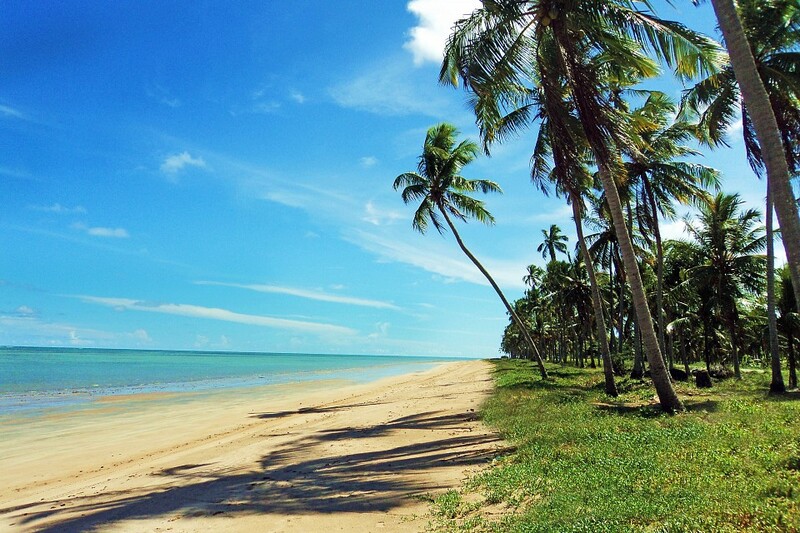 Those who visit the city of Marechal have to go to the French Beach – with an unparalleled beauty and one of the strongest points of the history in the state of Alagoas; and the Saco Beach – known for its famous rock formation which at low tide gives rise to beautiful, natural pools, excellent for swimming. This tourist city in Tupi language, ‘Paripueira’ means ‘calm waters’. Paripueira's main attractions are their beautiful beaches with natural pools. The city also lives with the joy of carnival celebrations, promoting one of the largest carnivals in the state, besides the traditional Feast of Santo Amaro in January in honor of the local patron saint. The main tourist point of Paripueira is the Sonho Verde beach that stands out for its beauty and for its infrastructure. Other highlights are its calm and clear waters, its golden sands, and the many inclined coconut palms in addition to several reefs which forms natural pools. The landscape of colorful cliffs in red and beige, and the sand dotted by colorful stones make the visit to this beach unforgettable. This stunning setting is difficult to access being at 45km from the capital and can be visited by any tourist. Tapioca - a kind of pancake made with a cassava flour and with various fillings. Arroz doce – a dessert made with rice, milk, and sugar. Bião de Dois Alagoano – a dish made with rice, beans, assorted meats, and coconut milk. Peixe ao molho de tomate – a dish made with slices of fish, olive oil onion, and tomato sauce. There is a wide range of hotels in the city, like Meridiano Hotel, Salinas do Maragogi, Salinas de Maceio, Radisson Hotel Maceio, Hotel Ritz Suites, Hotel Praia Bonita, Village Barra Hotel, Conde Hotel, among others. The tourists avail of these hotels at the average price of 150 BRL per day. For the more adventurous tourists, there is the option to camp, both in their own tents and in close quarters, where many families get together. 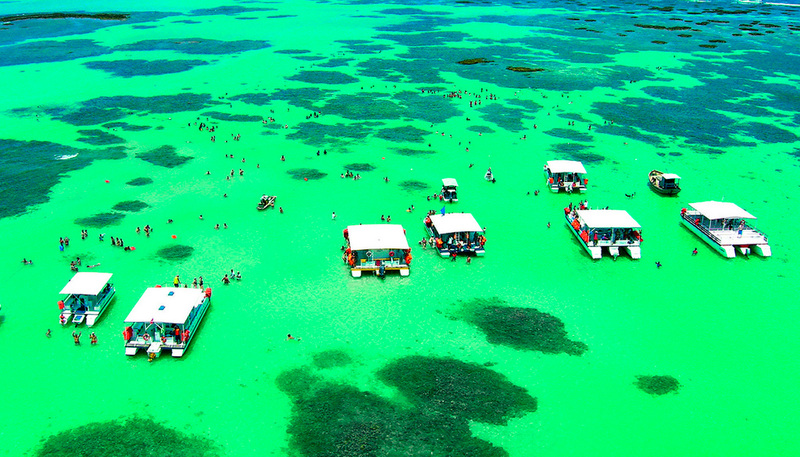 Being a tourist town, Alagoas has several means of transport to ensure the needs of all tourists. There is motorcycle taxi services, taxi, mini bus for larger groups, and a lot of reliable public transportation. Also, the tourists can request the service of some famous agencies such as Cocuripe Transportes Especializado (+55 82 3354 3000), Gvan Locadora (+55 82 3235 4165), Aluguel de Carro (+55 82 4003 7366), Rota Car Locadora (+55 82 3327 3388), LocaFrota (+55 82 3313 5008) and Avis (+55 82 3036 5341). The state of Alagoas, despite being beautiful and a great place for a family vacation or even between friends, it is not the safest place in Brazil. In 2013 the state was considered the most violent state in Brazil, with 72.2 homicides per 100,000 inhabitants. Today the security was strengthened, but it is still a violent place. So, a tip for tourists is to explore without attracting attention.